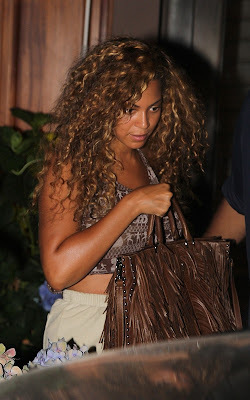 Bags with fringe are also in this summer favorite celebrities who love casual boho chic or Bohemian. Vanessa Hudgens, a true fan of this kind of accessories designed especially popular American brand JJ Winters can not separate them lately Lucky Brand bags of leather, with fringe and beads, Kate Hudson was photographed wearing the bag Chocolate from Ralph Lauren in numerous occasions, and Beyonce Prada brought to light a few seasons ago. Another famous fashionista, Jessica Szohr, gateway to filming "Gossip Girl" bag latest released by JJ Winters Fringe.